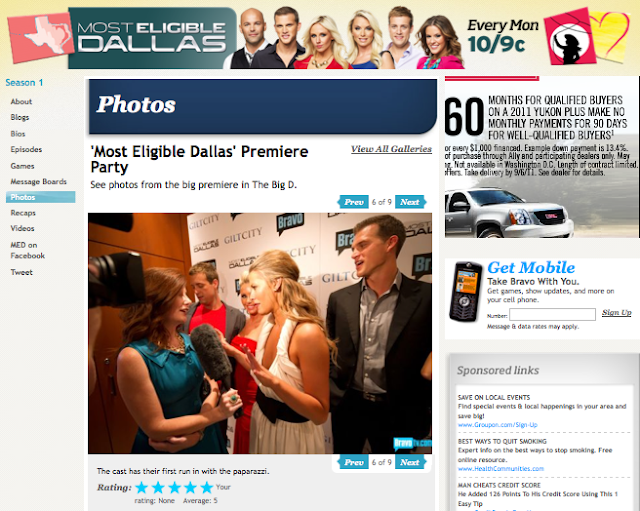 Bravo TV dubs "Oh So Cynthia" Smoot "Paparazzi"
Photos from the red carpet premiere party for Bravo TV's Most Eligible Dallas party just landed on their website. And look who made an appearance - ME! I often joke that for all of the many events I go to, I somehow never land in the "party pic" pages of the local press. This is the biggest "Where's Waldo" moment yet! Take that Modern Luxury and Paper City. Ha! Click the photo to go to Bravo's website and view more pics from this event. Mine is #6. The most hilarious part, is that even though Bravo was provided my name from the local PR company that took these photos, they chose to dub me as "paparazzi". But, I'm not complaining. I was actually acting as a correspondent for WFAA's Daybreak, interviewing the cast on the red carpet. My segment will air Friday, August 19 around 6:20 AM. If you thought my head was big before... there's no living with me now! Ha!